This week me, Jess, Mia and Khloe got out to explore some of the fantastic, pocketed rock at this area that is located about a half mile from another group of boulders I posted about about recently. The Lost City is a sub area of a large area called Boulder Mountian. Lost City is a spot that has a rich concentration of rock. As the name suggests this area resembles a city of large boulders strewn across the forest and luckily is a reasonably short drive from Portland. Also a geologic term called a rock city is a landform where passages and gardens of boulders are created. Or in laymans terms a really cool place to boulder. This is a great new addition to Portland bouldering. The problems here range from V0- to V9 currently with potential for several really sick lines that are not sent yet that will surly be V10ish. This area really showcases some of the beautiful boulders we are lucky to have in the Pacific Northwest. It was a quick/short day out as we had been enticed to go biking on a nice ride near Hillsboro but it was great to escape the hot temps and climb in the shade a bit. I’d like to mention that I am not the first person to boulder here. There have been one or two other climbers who have passed through here a few years ago and developed a few really nice classics. There is about 50 boulders in this little group we explored. We sent about 10 problems, most ended up being easy but we did find a really nice hard problem to send. Im hoping to get back soon and clean a ton more rock. Next Ascent has a guidebook to all the boulder problems, directions, topos, and more for all of Boulder Mountain and Lost city here. Posted in Pacific Northwest Bouldering Blog, Portland Bouldering and tagged Bouldering, ORegon, Portland. Can you give any details as to how to find this place? 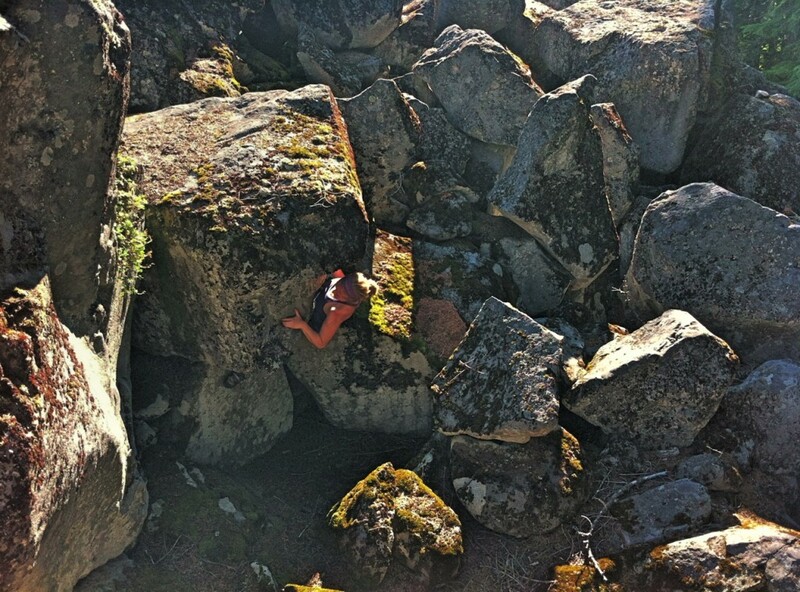 I’d love to check out some new bouldering areas around Portland. No, problem just sent you an email but its up near Hood, not a bad drive from PDX though. I would love to know how to get there as well. Looks amazing! Thanks. Thanks for your interest, I will send you an email with details. Wow this sounds fantastic, we need more bouldering areas. I would appreciate knowing where the lost city is. Great to hear from you Mike and thanks for the email. Where is this spot exactly? Thanks! Hi there, thanks for the head’s up on what sounds like a sweet spot. Would you be able to pass along access info? This sounds like a great area. Could I get those location details as well? With a description like that how can I not go? How do I get there?! It sounds fantastic! Thanks for the knowledge! I’d love to check this spot out. Can you tell me how to get there? Sorry for taking so long to reply. This ares is located right near Mount Hood in Hood National Forest. It’s about a 10 minute drive from Timberline. Just off the side across from Trillium. I think the road may still be closed. I will check on the road status and post a map up here ASAP. Again sorry for the delay. Is it off of HWY 26, or off of Timberline road? 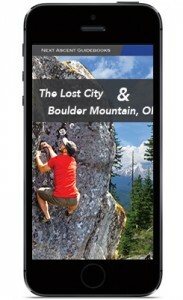 GPS Coordinates would be awesome if you have them…..
We just made a guidebook app that has all the problems at Lost City and Boulder Mountain. There is a link above. As a thanks to everyone who hanged in while we finished the app, you will get a free guidebook for Smith Rock in the app at this time. You will also be able to download free Northwest apps within the app later this year.